If you enjoy playing golf in Florida, then our Souther Dunes villa is ideally situated for playing this award winning course – adjacent to the first tee – no need to drive your car to the start of a game! Just pick up a cart and go! 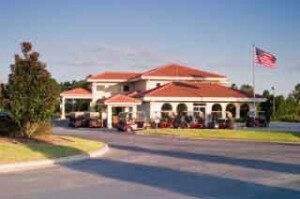 The Southern Dunes Golf and Country Club receives excellent reviews from local and visiting golfers alike. If you are intending to play a lot of golf, it may be worth investing in a monthly membership card – ask at the pro shop. This allows unlimited golf Monday to Thursday – all you pay is the cart fee. Other special deals are also available – for latest information visit the Southern Dunes website. The design of the course is enhanced by the well maintained playing surfaces. This dramatic hillside layout stretches to over 7,200 yards and features 100 ft. of elevation changes, not typically found in Central Florida. Five sets of tees welcome golfers of all skill levels to enjoy risk/ reward opportunities, through extensive mounding and strategically placed bunkers. 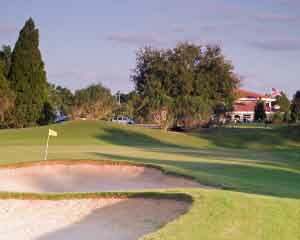 And if you want to try other courses, there is a wide variety of golf clubs nearby and further afield.